Most think of new pallets when thinking about a pallet manufacturer; however Edwards Wood Products also has a pallet recycling operation. We bring in damaged pallets and perform repair analysis on them for the possibility of recycling those that meet the criteria for further service to our customers. Pallets that are deemed as un-economical to repair are dismantled and chipped up for our landscaping materials department. 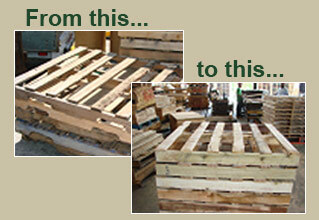 For more information regarding our Pallet Recycling Operations and what we can do to help, contact us today. In 2005, North Carolina enacted House Bill 1465, which bans the disposal of wooden pallets in municipal solid waste landfills by October 2009. Damaged pallets used to end up in the landfills to get buried and eventually decompose. 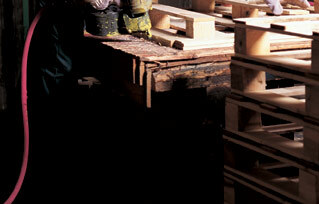 Over time, a substantial amount of time, old pallets would decompose. Eventually the steel fasteners would rust away. All of this went into underground springs and waterways.